Among the spring heralding frogs, the Wood Frog is among the earliest, although it is usually trumped vocally by the Peepers and Chorus Frogs. As a species, they have the northen most distribution of any amphibian and can be found north of the Arctic Circle. Woodies, as you might expect given their name, are basically woodland creatures that spend most of their life as a silent residents of the leaf litter world. When these secretive frogs approach temporary pools in the spring to breed, they let it all hang out – so to speak. If they were people, you’d say that they let their hair down, but since frog fur is about as fine as you can get, that would not be a good analogy. In the flesh, these golden brown frogs are about 2 inches long and are endowed with very distinctive face masks – often referred to as a robber’s masks (see here). In the aural arena, Wood Frogs are champion quackers. Their croaks come out as “chucking” notes sounding more like expresso hyped ducks than a frogs (Listen here – In this sound segment you’ll notice that a gang of creeking Chorus Frogs are also participating in the battle of the bands). I recorded these calls in a flooded woodlot in Oakland County. The creatures were out in the deeper water and quite out of my reach – being sans hip waders at the time. Had I of waded out to the center stage, where the action was, I would have been able to see the callers themselves and their gelatinous egg masses. All the females tend to lay their eggs into one large communal egg mat with each one contributing over a 1,ooo eggs a piece. While I can’t show you the Wood Frog eggs, I can show you some Smallmouth Salamander eggs. These precious packets were laid in a woodlot pool in southern Wayne County (see title picture). The salamanders that laid them were long gone by the time the eggs were collected. Prompted by the first warm rain of late winter, these blue-speckled amphibians (see here) migrate to their ancestral pools to breed – answering the same instinctive call that beckoned the Chorus & Wood Frogs. Unlike the frogs, however, salamanders are silent breeders. Oh, they get frisky alright, but their manner of breeding consists of a pantomimed dance in which the male lures the female over their sperm packets. Once fertilized, the females drape small clusters of jelly eggs (masses of 3-30 eggs) onto submerged sticks and stems. The whole egg-laying thing is over in a matter of a few nights, after which the adults slink back onto land and vanish into the leaf litter. The pictured eggs are “well along.” As you can see, the embryos are clearly visible inside their 1/2 inch jelly spheres. When put into the proper light, the multi-layered structure of the eggs becomes evident (see below). There are at least three membranous capsules, with the inner two visible as a set of clear double lines, encapsulating the developing salamanders inside. The embryos themselves appear to be at least a few weeks into their growth. Each has three pairs of external gills, a pair of so-called “balancers” sticking out from each cheek, a well developed tail fin, and a pair of stubby front legs. Every now and then, they will do a loop-de-loop inside their capsule as if testing out their swimming abilities, but for now they wait for the big moment when they will break out into the big world (any day now based on their stage of development). We’ll get back to these little smallmouths at a later date in order to track their growth, but there is one more egg feature I’d like to point out before we call this discussion over. You may have noticed that the eggs, although mostly consisting of clear gelatine, appear to be speckled or greenish. These spots are actually evidence of a species of algae that grows within the gel. Eventually the entire cluster will take on a bright green hue due to the growth of these tiny plants. 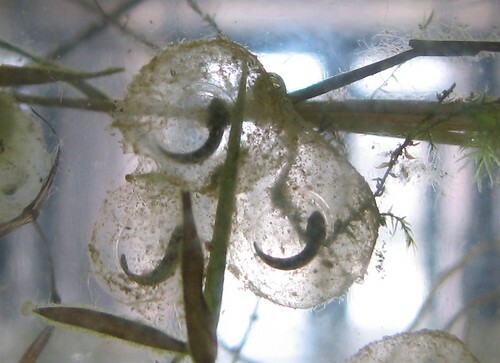 The algae is question, called Oophilia amblystomalis, is only found on amphibian eggs. It is believed that the algae not only removes excess ammonia and nitrogen from the eggs, but also creates an oxygen rich environs for the larval salamanders. A beneficial algae in symbiosis with a minimally-mouthed salamander? I’ll wager that you never saw that one coming! 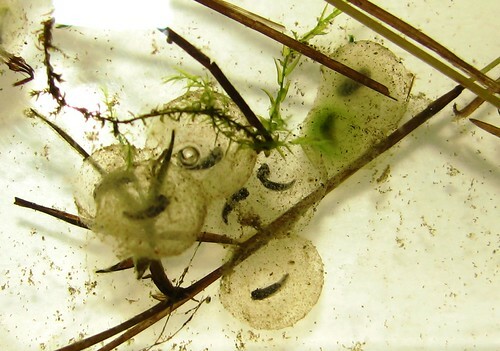 Is there a way to tell frog eggs from salamander eggs? We have wood frogs in our pond, which I love listening to every spring, but I’ve never seen salamanders. I always see huge balls of gelatinous eggs, but always assumed they were all frog eggs.